For all of your #1Day1SMC Donations! 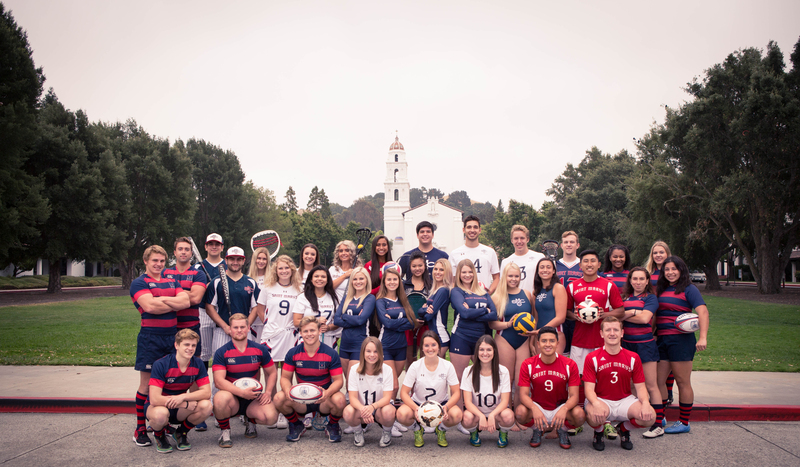 The Saint Mary's Club Sport Program is managed by SMC Campus Recreation and offers students a high competitive program in 15 different sports. Each team is registered with local or national league affiliation and is led by SMC students. Register for a Club Sport or meet us at the involvement fair for more information. Get Involved | Don't Wait | Find out more here. MORAGA, Calif. - Saint Mary’s Women’s Club Volleyball absolutely demolished the competition this season coming away with a 10-0 record. The Gaels rolled through their season without a loss, an accomplishment Senior, Madison Lattner says comes from the hard work and team chemistry behind the scenes. That extra effort was well worth her time. The undefeated season marks another huge accomplishment of SMC Club Sports. Lattner’s club volleyball career may be over, but her experiences will live on. MORAGA, Calif. - Saint Mary’s Women’s Rugby continues to roll this season after defeating Fresno State at home on Saturday marking a special victory for all the seniors who took to the pitch. The Gaels took home the win putting up 24 points against their long time rival, Fresno State who only managed to throw 19 on the board before the final whistle. Janet Miramontes, Junior has been with the club for three years, and beating Fresno is just another great memory in the books. The hard work has been well worth it and there is proof that the club continues to evolve. The 7's team placed 3rd out of 16 teams at the Las Vegas Invitational. NSCRO Selects placed 1st & 2nd, which consists of nationally selected rugby players across the US. Rugby calls for chemistry between players for a full 80 minutes. The culture around the program is key to the club’s success. Beating Fresno at SMC is a huge task that the Gaels faced head on this season. Janet knows that this win is important moving forward. “That moment will forever be cherished by the team, along with seniors at their last home game” Miramontes said. Saint Mary’s Women’s Rugby will travel to San Luis Obispo to face Cal Poly on March 16. MORAGA, Calif. - Saint Mary’s Women’s Lacrosse split the weekend this past Saturday and Sunday. The Gaels lost on Saturday to Santa Clara 16-6 in heavy rain at home, but were able to collect a win on Sunday versus UC Davis with a final score of 12-8. The team will take the field again next Saturday, March 16 facing UC Berkeley at home beginning at 1pm. SANTA CRUZ, Calif. - Men’s Lacrosse traveled to Santa Cruz to face a talented side and kept the test close throughout. SMC lost to Santa Cruz 13-12 this Saturday but Austin Chau, a senior on the team, sees more than a loss on the record. The close competition proves the talent and depth of the team’s roster. However, there is always room for more men on the team according to Austin. Men’s Lacrosse will continue to grow as new players and new opportunities continue to come their way. DAVIS, Calif. - Saint Mary’s Women’s Club Soccer was defeated this Saturday after UC Davis came out firing. The Gaels took home a loss but Junior, Kellie DeMaria thought the game offered a few key learning points despite the difference in score. Kellie and the Gaels will take on Sacramento State next and hope to apply what they have learned from this most recent match in order to come out strong against the Hornets. “Davis is a phenomenally skilled team, and we were able to learn a lot about ourselves and where we need to work on improving in our team presence on the field as we look ahead to the rest of the season” DeMaria said. SACRAMENTO, Calif. - Men’s Club Soccer took on Sacramento State this weekend and kept it close but was unable to find the back of the goal a second time. The Gaels tied with Sac State 1-1 in a game that Junior, Tyler Carino thought could have been won if it weren't for a couple obstacles coming in the form of injuries. The team will travel to Davis to take on the Aggies at 2pm on April 6. MORAGA, Calif. - This past Sunday, Saint Mary’s Men’s Volleyball took on the San Francisco State Gators in a mid afternoon matchup at home. The Gaels pushed the match to a fifth set but ultimately fell short. The Gators took home the win beating SMC 3-2. Men’s Club Volleyball next plays in the D1/D2 Crossover Tournament on March 9 at Stanford, CA at 12:00pm. SAN FRANCISCO, Calif. - This past weekend, Saint Mary’s Women’s Club Volleyball crossed the bay to compete in an SF crossover tournament on Saturday and Sunday. The Gaels came to play beating William Jessup University 2-0. Next, SMC faced University of the Pacific and put up the same score against the Tigers from Stockton. The weekend wrapped up on a high note as the UC Davis could not keep up losing 2-0. The Gael’s swept the weekend in a strong performance. Women’s Club Volleyball will take on SFSU on March 3 at home at 1:00pm. PITTSBURG, Calif. - Saint Mary’s Men’s Club Baseball faced Humboldt State on Sunday but fell short 2-0. The Gaels will revisit the Loggers in a double header on March 9 in Pittsburg, CA. TEMPE, Ariz. - Saint Mary’s Women’s Club Lacrosse traveled to Arizona for two matches this past weekend. Arizona State hosted SMC in Tempe on Saturday evening. Unfortunately the visiting Gael’s could not find the net and fell to ASU 15-6. The next stop was Phoenix where the Gael’s took on Grand Canyon University in a mid morning game. SMC kept it close but GCU finally pulled away taking home an 11-9 victory. Women’s Club Lacrosse will travel to San Luis Obispo for a 2:00 pm matchup against Cal Poly on March 3. MORAGA, Calif. - Saint Mary’s Men’s Lacrosse hosted UC San Diego this past Sunday on home turf. The Tritons came prepared for their trip north however frequently finding the back of the net. The Gaels fell short losing 14-4. MORAGA, Calif. - Saint Mary’s Men’s Club Soccer took UC Davis this past weekend. The Gaels came to play and the Aggies couldn’t keep up falling to the Gaels, 4-3. The Gaels will return home to face off against CSU Chico on Saturday March 2 for an 11:30am kickoff. MORAGA, Calif. - Saint Mary’s Women’s Club Soccer hosted the University of Nevada Reno this past Sunday. The Gaels kept the game close throughout and the score remained that way through to the end. SMC tied UCD 1-1. MORAGA, Calif. - Saint Mary’s Women’s Rugby took on UC Santa Cruz at home this past Saturday at home on Pat Vincent Field. The Gael’s continue to roll this season defeating the Banana Slugs 43-12. Women’s Rugby will next host Fresno on March 6 at home for a morning match on PV Field kicking off at 10:15am. SACRAMENTO, Calif. - Saint Mary’s Stunt competed in three stunt games this past Saturday but unfortunately did not come out ahead. Sacramento State, UC Davis and Cal Poly all earned higher scores than the Gaels. Stunt will next compete in a tournament hosted in Berkeley beginning at 8:00am on Saturday, March 23.